A Nilo-Saharan ruler by the name of "Kush" (Cush) is first mentioned in the Bible as the father of Nimrod and Ramah. Kush and his sons were rulers who controlled the water ways in their territories. The rivers were used to transport cargo and supplied the necessary water for mining industries. Kush was famous for gold, a fact to which Genesis alludes when speaking of the river Pishon that flowed through the land of Ha'vilah, where there is gold (Gen. 2:11). Another African river is the Gihon which wound through the land of Kush (Gen. 2:13). For the Kushites gold symbolized the Sun, the emblem of the Creator. The Creator's appointment of rulers is depicted by a solar image on or over their heads. 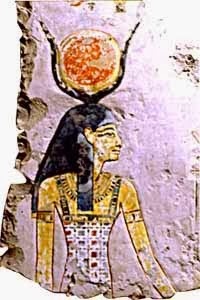 Hathor is depicted as being overshadowed by the Sun. This indicted that she is appointed to bring forth Horus, the son of Ra. Ra was sometimes referred to as a "mountain of gold." Horus is called the Golden One" and is depicted as a falcon perched on the mast of Ra's solar boat or with golden rays of the Sun on his head. Similar solar imagery is found wherever the Kushites dispersed. The gold mines of Kush were described by the Greek author Diodorus Siculus. He mentions fire-setting as a method used to break down the hard rock. The same method is used today in Africa to extract gem crystals from the hot rock over which buckets of water are poured repeatedly and in quick succession to cause rapid cooling. The ore was then ground to a fine powder before washing. The process required a substantial source of water, such a river. Mining operations found in desert areas suggest that there was more water during the time of the Kushite expansion. Genesis 10 speaks of the migration of the Kushites into Mesopotamia, Anatolia and Bactria where they are called "Kushan." This is one of the later migrations out of Africa, between 4000 and 1500 BC. Nimrod is noted in Genesis 10 as one of the Kushite kingdom builders. He and his brother Ramah were the sons of Kush. Both moved out of the Nile Valley to establish territories; Ramah in Arabia and Nimrod along the Euphrates in Mesopotamia. The Kushite rulers were a highly organized and militaristic. They ruled of territories consisting of numerous clans and castes. The marriage and ascendancy pattern of their rulers drove their expansion into new territories. They were skilled in hunting, combat, sailing, astronomy and metal working. Their rulers controlled the major water systems and founded early mining industries along the Nile and in southern Israel. Amen, a name for God was favored over the name Set, which was favored in the Delta. It was during the 18th dynasty that the title 'King's Son of Kush' was first used. The first rulers of a unified Nile Valley were Kushites. The Biblical prophets group Mizraim (Egypt) and Kush (Upper Nile/Sudan/Ethiopia) together because the Lower and Upper Nile regions were first unified by the Kushite ruler Menes (Meni) around 3000 BC. Whether Menes was Narmer or Ahauiti, his unification of the Upper and Lower Nile established him as the founder of a new House/Dynasty. This remained the case even after Mentuhotep II reunited Egypt after the 1st Intermediate Period. Instead of being recognized as the founder of a new House, Mentuhotep II was considered a ruler of the 11th Dynasty. Another Kushite ruler was called K-ash-ta, meaning "the Throne of Kush." The Saharan origins of the rulers of Egypt has been well documented by the Canadian archeologist Mary McDonald. Biblical Kush was a vast region that included Egypt, Sudan, Nubia, the coastal areas of the Horn of Africa, and the Afro-Arabian populations living in Ramah, Sheba and Dedan. DNA studies show "genetic unity and linkage" between the Sudanic, Egyptian, Nubian and other Nilotic peoples, as well as some populations of the Horn of Africa. (Yurco (1996), Keita (1993, 2004, 2005) Lovell (1999), Zakrewski (2003, 2007). The Copts are one of the oldest Egyptian populations. This is based on the relatively high frequency of the B-M60 marker, indicating early pre-dynastic colonization of Egypt by Nilotics. In 2007, archaeologists from the Oriental Institute discovered a 4000 year gold-processing center along the middle Nile in the Sudan. The site is called Hosh el-Guruf and is located about 225 miles from Khartoum. More than 55 grinding stones made of granite-like gneiss were found at the site. The ore was ground to recover the gold and the water was used to separate the flakes from the particle residue. Similar grinding stones have been found in Egypt and at Timnah in southern Israel. Workmen clear the surface of a second-millennium cemetery discovered by Geoff Emberling's team. The site is now flooded by a massive dam. Geoff Emberling, Director of the Oriental Institute Museum and a co-leader of the expedition that discovered the gold working operation at Hosh el-Guruf, reported that his team also discovered a cemetery with Kushite artifacts at the nearby site al-Widay. These included high-status pottery vessels that appear to have been made at Kerma, about 225 miles away. Kerma was one of the most important centers of ancient Kush. 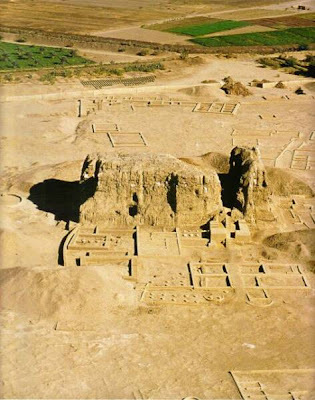 Excavations at Kerma have uncovered a walled town surrounding a monumental mud-brick temple. In a royal cemetery to the east, four massive grave tumuli contained several hundred human remains. The remains were surrounded by thousands of cattle skulls. This was a common burial practice among to the Proto-Saharan peoples. The cemetery near Hosh el-Guruf included 90 closely packed stone circles. The covered shafts were circular and lined with stones, a typical feature of the Pan Graves of Proto-Saharan nobility. Pan Grave cemeteries have been found at a number of sites in Sudan, Egypt and Ethiopia. These graves are associated with the Beja, an ancient metal working people of the Sahara. The Egyptians called them "Medjayu." 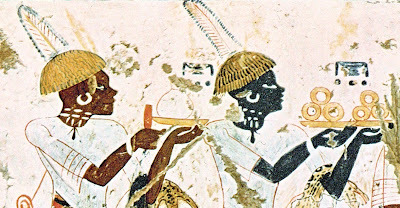 They brought gold to Egypt from mines deep in the heartland of Nubia and Kush. At the Temple at Dendur in Nubia the sons of a local Beja chieftain, Pedisi and Pihor, are honored. Ped-isi refers to Hathor who was later called Isis, and Pi-hor refers to Horus. In the first room of the Dendur temple, reliefs show the ruler praying. The middle room was used for offering ceremonies and the inner most room was the sanctuary of Hathor/Isis. The only carvings in these two rooms are around the door frame leading into the sanctuary and on the back wall of the sanctuary. These show Pihor worshiping Isis and Pedesi worshiping Horus. The oldest layer of occupation at Hosh el-Guruf dates to the later Neolithic period (ca. 4000-3000 BC.) and corresponds to the urban center at Nekhen, the shrine city of Horus. His mother, Hathor, was venerated as the patroness of metal workers. The Kushite center at Kerma, by comparison, dates from 2450-2000 BC. The rulers of Nekhen had access to sub-Saharan the mineral resources of the eastern desert. 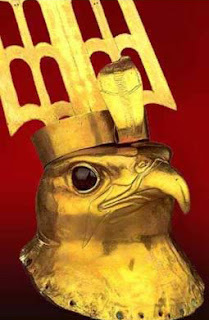 The high quality of the gold work at Nekhen is evidenced by the discovery of this gold plumed falcon representing Horus. The mining center at Hosh el-Guruf and the nearby cemetery document the sub-Saharan kingdom of Kush, but the book of Genesis provides the most significant information about the Kushite expansion into Arabia, Canaan and Mesopotamia. It tells us that Kushite rulers moved out of Africa and became established in distant regions. Nimrod is mentioned as a specific example. The center of his kingdom was Akkad and the script of his kingdom was Akkadian. Emberling adds to this distorted picture with this statement: “Studying Kush helps scholars have a better idea of what statehood meant in an ancient context outside such established power centers of Egypt and Mesopotamia.” Statehood would have been a foreign notion to the Kushites. They were empire builders and the evidence points to the power centers of Egypt and Mesopotamia as owing a great debt to the Kushites. The Afro-Asiatic languages have four geographical groups: northern peripheral, northern central, southern central, and southern peripheral. Akkadian and Amorite are in the northern peripheral group. The northern central group includes the ancient Canaanite, Ugaritic, ancient and modern Syriac and Hebrew, Moabite, Old Aramaic, Amorite, and Phoenician and its Punic dialect. The southern central region includes Arabic, Maltese, and the archaic Oasis North Arabian dialects, some of the earliest attested belonging to the group. The southern peripheral region includes South Arabian dialects and the languages of northern Ethiopia. Gold was associated with Horus, whose emblem was the sun. This is evident in the Babylonian word for gold hur-asu. The Egyptian hr means "the One on high." The Turin Canon, which provides important information on Egypt's early history, describes the Predynastic rulers as "Followers of Horus" and Horus as the "Ruler of the Two Horizons." The ancient Egyptians observed the death of Horus (Osirus) in a 5-day festival. The first 3 days were marked by solemnity and fasting, as Plutarch noted in Isis and Osiris, 69. His death on the 17th of Athyr was commemorated by the planting of grain. On the third day, the 19th of Athyr, there was feasting to celebrate Horus’ rising to life. It is no coincidence that Jesus alludes to the ancient Horite myth when informing his disciples of his impending death. He said, "I tell you the truth, unless a kernel of wheat falls to the ground and dies, it remains only a single seed. But if it dies, it produces many seeds." (John 12:24) In referring to himself as the "Seed" Jesus alludes to the promise God made to Abraham's Edenic ancestors that the Seed of the Woman would one day crush the serpent's head and restore paradise (Gen. 3:15). In your view, what caused the definitive break between the people of God (Seth, Noah, Abraham, David, etc...) and the cult of Horus? It goes without saying, as you know, that when God revealed himself to Moses on Mount Sinai he revealed himself as "I AM" not "Horus". Also, in Ezechiel, he condemns the Jews for worshipping Egyptian gods. So, how do you see the transition from Horus to Yahweh in the progression of the Horites towards the knowledge of the One True God? Jewish interpretations have influenced how Christians read the Old Testament. This was less the case in the early Church. When you read the Church Fathers you find strong condemnation of the rabbinic interpretations. Today, Christians tend to read the Old Testament through rabbinic sources. Many seminaries and pastors use commentaries written by non-believing Jews. This is especially true among American Evangelicals, Fundamentalists and Dispensationalists who constitute the majority of Protestants in the USA. The prophets were right to condemn Egyptian polytheism. The Horites were not polytheistic. They believed in a single Creator whose son was Horus and they spoke of the Father and Son as equals. 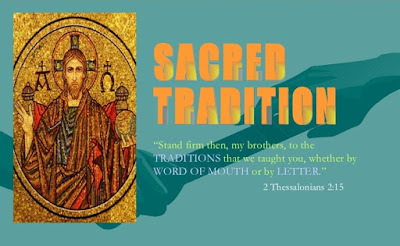 Christianity emerges from a tradition much older than Judaism. In this sense, the core of the Christian faith is the oldest known religion. It took the Apostles a while to sort this out since they were brought up in post-exilic Judaism which is very far from the faith of Abraham and his Horite ancestors. However, after the Resurrection, the Apostles recognized Jesus as Messiah and began to insist that unless one believed that He is the Son of God one cannot be saved. From that point, the division of Christianity and Judaism was inevitable. Here we find the words of Psalm 110:1, from David, also a Horite ruler. The LORD says to my Lord: "Sit at My right hand until I make Your enemies a footstool for Your feet." I hope that this answers your questions. If not, please email me or leave another comment. Thanks for investigating further! Hi Alice again, I posted earlier today. I have been browsing through your website. 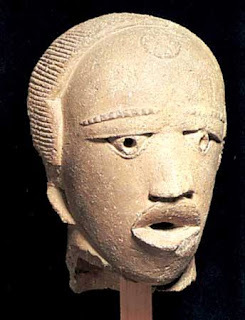 Am I right in deducing that you think Cush son of Ham are the same as the Kushites of Africa? Cush's (Ham) name was Sumerian in origin and by the way in Sumerian the name does not mean black if that is how you are drawing your conclusion. His descendents went east as the bible says and Nimrod built Babylon/Assyria. Kush (neighbor to Egypt to the south) does mean black. Will that be the reason you seemed to infer on another post that the Canaanite tribes have origins in Nigeria? The Kushites are Nilotic peoples. "Kushite" is a general term that includes many groups, clans and castes such as the Ainu, red and black Nubians, and the Horites. Abraham's ancestors were Proto-Saharan Kushites and originated in the Nile region of Sudan. From there some went west to the Benue-Niger Trough (Nigeria), but not many. Most moved into Arabia and from there to India. Thanks again, Alice. I really need to study this some more.